My experiences with 100 Miles of Istria date back to 2013. That year I ran my second race in the 100km range together with my friend Anders which I hiked most of the PCT in 2011 with. We finished in somewhat like over 18 hours. I came back in 2015, this time I wanted the full Istria experience. I entered the 100 mile race. I failed. I tried again in 2016 and finished the whole thing in under 24 hours. One year later I failed the same distance again. Now on to this years race, the blue course, from Lovran to…Groznjan. Having had some good race experiences in 2017 one thing was sure. I did not want to „just“ finish this race, I wanted to know how fast I can finish this race. I wanted to race and I did just that from the beginning. This is not very smart and I know that. Not at that distance and not this early in the year with some key training sessions missing because of this and that but mostly because of a long winter in the Alps. The start from Lovran is relentless. From sealevel up to the highest point on Mt. Vojak in 1300 vertical meters. Road, stairs, trail, snow, mud, water until the treeline is behind and a windy, rocky ridge is leading to the summit where the course drops down into the first aid station. I know the downhill pretty well, on the 100 mile course you have allready more than 30km in the legs, so it was nice to run it on relatively fresh legs this time. The snow and mud however did it not make too easy. For the first time I have noticed that it was a bad Idea to run with a smaller, lighter headlamp. Because of the dim light I had to focus too much on not missing the course markings. Also it was obvious that the dim light is making me more sleepy than the light from my Lupine lamp. However that was the situation for now and I had to deal with it for the next 5 hours. The night was cold again, last year I did not take the time to dress, so my DNF was a result of needing to much energy to keep my body temperature. This year I learned and dressed aproppriate to the temperature which was just around freezing. I noticed some changes in the course, I have some favourite parts on the course which I was looking forward to like the technical part before CP2 in Brgudac which was rerouted over wide forest track. After the aid station we went up a part of that downhill and turned west later. I loved the technical sections which broke up the monotony and fast running from the forest roads. I passed more and more runners from the 100 mile course, occasionally some words of motivation where shared along the way. We were all together in the deep, dark, cold and muddy forest looking for our limits. If only we could bottle that energy and turn it into something usefull! My mental game was not very strong and I asked myself questions which you should not ask yourself especially not during a race of that kind. I noticed that my focus is not 100% where it should be. I tend to get bored on sections where you don´t have to focus on the terrain. I always looked forward to the technical parts of the course so the downhill into Buzet was something I was very happy about. By the time I reached Buzet (km60) the sun was allready out and a bright blue day was awakening. I missed my prefered split time for Buzet by about 20mins, but I knew that this time goal was illusional. I felt good running into the big sports hall where I picked up my drop bag and got assisted by Evelyne who ran a faboulus race at the 70k which was about to start from Buzet later. But I noticed that I had problems talking to her. I felt like drunk, which could be a result of dehydration. So I took care of that. Because of the cold temperatures and my „in and out“ aid station strategy, I did not take care enough about my fluid intake. Which was of course the next big mistake. However I noticed it now and downed some liquids, grabbed some gels, changed into a lighter shirt, dropped the headlamp for a lighter one and went out again. I felt the effort, but was still able to run and not overly concerned in not making it. The next stretch was the longest without an aid station. 19 Kilometers where I did not see a soul expect some of the crew from the race. At this point of the race I was in a mental state where time and distance as such did not matter anymore. I was just focused on getting one foot in front of the other, trying not to stumble and fall over roots and rocks on the trail. I was looking forward to meet my parents at the next aid station which where willing to crew me from there. My parents allready where awaiting me, we chatted a little bit, which was kind of uplifting. I drank and took care of my nutrition and made my way towards the course. When I entered the CP the runner in 5th position just left. I kind of knew that I might not catch him, so I took some more time. When I left, a young Norwegian runner just entered. We talked a few words. I think he followed me also in the descent into Buzet but he held back, saving energy. A smart man. At that point I had no idea nor initial thoughts of quitting at the next CP 11 km later. I left before him but soon noticed that he caught up, I did not care too much I did not speed up or anything. I just tried to keep moving steady. Just before Groznjan he made the move and overtook me and from that moment I noticed that my stride is not there anymore. I was just able to shuffle my legs back and forth. My hamstrings got completly tight down over my knees into the calfs. I just had wooden sticks instead of legs from one minute to the other. I know the feeling of running on stiff or hurting legs, but this was different. I immediatly started walking, I grabbed a gel and a salt capsule and downed that with my left water supplies. I walked about 300 meters and tried to start running again. I could not. Entering the aid station I told my parents that this is it. I am going to quit. They remembered me of my race last year where similar problems occurred. I told them before the race they should not let me quit too fast, instead I should take my time, sit down, rest my legs up high, eat & drink. So I did that, I tried all kinds of thins to get me going again, but with the resting my temperature also dropped and I fell into a kind of shivering. I got really cold even the sun was out. I stood up, which was very hard with stiff legs and tried to get into a running stride again. After a couple of meters I returned and realised that it was over. Which was hard, because I really wanted that top ten finish. I felt not overly tired nor weak, my legs where just unable to move. I have failed to cross that finish line again but gave all that I had that day. Racing and and going for a finish are totally different approaches. In this sport both are very hard in their own unique way. I dont want to loose my passion for this sport in taking approaches I did not enter it for. I am personally not very competitive. I think faster times and therefore higher goals evolve with training and experience. For now I go back to the basics. Taking the slow, controlled and hopefully progressive route up the mountain. Thanks to the ambitious support of the volounteers along the way, to Alen and his crew for putting on a great trail running event again and congrats to all the finishers and limit seekers out there. Keep it up! In der Vorbereitung bin ich über 5 Wochen einen Durchschnitt von 100 Kilometern + 5000 Höhenmetern/Woche gelaufen. Die längste Laufeinheit dabei war die Kreuzeck Traverse mit 60 km/4000hm. Ansonsten einige Bergtouren und Rennradfahrten, viele davon im regenerativen Bereich. Im wesentlichen galt es die Fitness aus dem Sommer mitzunehmen und im Vorfeld nicht mehr „zuviel“ zu tun. 2-3 mal pro Woche habe ich verschiedenen Core- und Mobiliätstrainings in das Training integriert. In der Rennwoche minimierte ich den Internetkonsum über Smartphone und Computer drastisch, das hilft mir dabei Fokus und Ruhe zu finden. Der Start erfolgte um 15:00 in der kleinen Altstadt von Omis bei bestem Laufwetter. Der Wettertrend wendete sich einem Tief zu, daher waren die Temperaturen im Vergleich zu den Vortagen angenehm, im Bereich von 20°C. Die Stimmung am Start war gut, ca. 80 Starter, darunter einige bekannte Gesichter warteten gespannt auf den Startschuss um die 155 Kilometer lange Strecke in Angriff zu nehmen. Meine Strategie war es, dass Anfangstempo erstmal abzuwarten und gegebenenfalls zurückzustecken, ein Rennen dieser Länge, entscheidet sich schließlich selten am ersten Hügel und so ließ ich die Spitzengruppe um Marjan Zupančič erstmal ziehen. Ich fand mich am ersten Hügel an 5. Stelle mit Sichtkontakt auf 4. Der erste Abschnitt durch eine Schlucht hinaus aus Omis war landschaftlich schon mal vielversprechend! Bei km vier verlief ich mich zum ersten Mal im Rennen. Ich verpasste eine Abzweigung und lief gerade aus weiter, bis es mir etwas seltsam vorkam, weder Läufer noch Markierungen zu sehen. Ich konnte eine Kreuzung in ca 150 Meter Entfernung erkennen und beschloss noch bis zu dieser zu laufen. Sollten dort keine Markierungen angebracht sein, bin ich garantiert falsch. So war es schließlich auch. Ich schaute noch einmal ganz genau, ob nicht vielleicht doch irgendwo ein Reflektorenband oder ein Hinweis am Boden angebracht ist. Danach drehte ich sofort um und vergewisserte mich während dem Zurücklaufen auf meinem Smartphone über den weiteren Streckenverlauf. Nach einigen hundert Metern retour sah ich bereits die Läufer in den richtigen Weg einbiegen. Die Stelle war ansich ausreichend markiert, wurde nur von mir übersehen. Meine fünfte Position war natürlich somit erstmal dahin, mittlerweile war sicher ein drittel des Feldes vor mir. Natürlich ärgerte ich mich über mich und lief darauf hin recht schnell um wieder aufzuholen. Andererseits wusste ich auch, dass ich so früh im Rennen genug Zeit habe und ich mich auch unter normalem Tempo wieder nach vorne arbeiten werde. Am ersten CP bei km 13 befand ich mich an siebenter Position, die Flaschen schnell aufgefüllt und weiter ging die Reise, immer wieder über schöne Küstentrails mit Meerblick. Das anspruchsvolle Gelände erforderte allerdings ebenfalls ständige Aufmerksamkeit. Zwischen CP2 und CP3 ging es dann durch große von Waldbrand betroffene Gebiete auf großteils gut laufbaren trails und Forststraßen. Unvorstellbar welche Auswirkung wohl dieser Waldbrand auf die Siedlungen und Städte in diesem Gebiet gehabt haben muss, immer wieder laufe ich an abgebrannten Autowracks und Gräben vorbei, die das Feuer am Übergreifen auf Gebäude aufhalten sollten. Von der Rauchentwicklung ganz zu schweigen. Die schwarzen Stämme der Bäume und Sträucher, in Verbindung mit einem Sonnenuntergang, der den Himmel in einen kräftigen rot-orange Ton färbte, war jedenfalls eine sehr spezielle Kombination. Ich freute mich jedenfalls auf die hereinbrechende Nacht, trotz der Tatsache das es erst in 13 Stunden wieder hell wird. Ich lief so lang wie möglich ohne Lampe, da ich erst beim CP mir die Zeit nehmen wollte mich auf die Nacht mit Stirnband, Ärmlingen und Lampe vorzubereiten. Dies resultierte darin, dass ich in einem dunklen Waldstück die Leuchtmarkierung übersehen habe und wieder einmal ein paar Meter falsch gelaufen bin…von nun an schwor ich mir Blödsinnigkeiten dieser Art einzustellen. Also Lampe auf! Das weitere Tempo durch die Stadt Solin war relativ hoch, die beiden nachkommenden Läufer, am Ende Position 2 und 3 stoppten so gut wie nicht und tauschten nur die vom Betreuerteam mitgebrachten Flaschen aus. Ohne Crew dauert so ein Stop natürlich etwas länger, man will sich ja auch mit dem Personal am CP ein bisschen unterhalten. Mein Gefühl sagte mir auch, mich nicht zu sehr stressen zu lassen, dieses Rennen ist schließlich noch lang genug und ich fühlte mich nach gut 4o Kilometern frisch, also weiter ging es durch die Nacht. Bei Km 73 bekam ich von Karin Fahrengruber die ihren Mann René betreute, ein für mich erfreuliches update zum Stand und Befindlichkeiten der anderer Läufer. Anscheinend war ich mittlerweile auf Platz 2. Dem führenden Slovenen Marijan scheint es zur Zeit auch nicht sonderlich gut zu gehen. Für mich natürlich nicht unwesentlich, dennoch versuchte ich einfach in meinem eigenen Rennen zu bleiben und meiner Strategie und meinem Tempo treu zu bleiben. Jetzt übermotiviert die pace zu erhöhen könnte sich in einigen Stunden drastisch schlecht auswirken, also versuchte ich zwar schnell zu laufen aber immer mit bedacht noch etwas im Tank zu lassen. Mein nächstes Ziel war Gata bei km 85 ein Meilenstein für den Kopf, da mehr als die Hälfte geschafft + Dropbag aus dem ich mich neu versorgen konnte. In Gata angekommen erfreute ich mich an der guten Stimmung, die durch alle Anwesenden verbreitet wurde. Marijan ging es leider wirklich nicht gut, er lag mit Magenproblemen in der Horizontalen und sah nicht so aus, als ob er in nächster Zeit weiterlaufen würde. Ich suchte mir mein Dropbag, diese waren sortiert aufgereiht, schnappte mir einen Sessel und streute den Inhalt meines bags vor mir aus. Ich nahm mir nur meine Gels und einige andere Snacks, verzichtete auf neue Socken oder Schuhe, trank ein Coffeingetränk meines Vertrauens wärend Karin sich um die Befüllung meiner Flaschen kümmerte. Das sich Karin, die ich erst 10 km davor kennengelernt habe so gut um mich gekümmert hat, ist nicht selbstverständlich! Ich wusste das ich diesen CP in Führung verlassen werde, wobei der Slovene Marko Prot auch nicht danach aussah als ob er sich lange aufhalten werde. Ich realisierte zum ersten Mal dieses Rennen womöglich gewinnen zu können, wusste aber, dass die Euphorie darüber nicht zu stark werden dürfe um nicht zu schnell zu werden. Schließlich liegen noch über 70 Kilometer vor mir und irgendwann wird auch mich die Müdigkeit einholen in der ich all meine Kräfte brauche. Aber im Moment fühlte es sich einfach toll an, das meine Strategie so gut aufging und ich von nun an der erste im Feld war. Meine Aufmerksamkeit galt besonders den Markierungen und dem Untergrund. Jeder weitere Verlaufer, oder gar ein Sturz könnte sich sehr schlecht auf den weiteren Verlauf auswirken. Ich hoffte einfach auf das Vorhandensein der Markierungen. Irgendwann war es dann leider soweit. Keine Markierung mehr zu sehen! Nach gut 90 Kilometern, mitten in der Nacht im nirgendwo kein Traumszenario. Es gab drei Möglichkeiten, ich entschied mich für die Bergabvariante. Leider nichts, also schaute ich am Gps nach wo es denn weitergeht, was allerdings auf Grund von einigen Olivenhainen und diversen Möglichkeiten kreuz und quer nicht ganz ersichtlich war. Ich war jedenfalls falsch also wieder retour zur letzten Markierung. Beim Anstieg kam mir auch schon Marko Prot entgegengelaufen, wenigstens suchten wir nun zu zweit. Aber auch er hatte keine Ahnung. Der Richtung dem gpx track folgend, entschlossen wir uns für den Olivenhain doch nach einigen Metern standen wir vor einem Zaun! Kein Weg hier durch, also wieder retour. Dann konnten wir die Straße auf der sich die letzte Markierung befand nicht gleich wiederfinden was zur folge hatte das ich irgendwo Querfeldein durchs Dickicht bin und siehe da, im Schein meiner Lampe erkannte ich in eine Leuchtmarkierung! Ich schrie zu Marko der es wo anders versuchte hinüber, dass ich ziemlich sicher den richtigen Weg gefunden habe. Wir waren beide erleichtert und ich versuchte auch gleich bergab meinen verlorenen Vorsprung wieder herzustellen. Marko folge mir nicht lange und ging sein eigenes Tempo. Bei km 120 konnte man schon deutlich die Morgendämmerung ausmachen, ich war bereit endlich wieder Tageslicht zu sehen. 13 Stunden Dunkelheit sind doch etwas lange, so sehr ich das Laufen in der Nacht auch mag. Beim nächsten CP informierte mich Karin wieder über die Zwischenstände, anscheind hat Marko Probleme mit einem Fuß und überlegt auszusteigen. Erfreulich ist, dass es René bisher gut geht und sie ihn demnächst erwartet! Der nächste Abschnitt war schwierig für mich, einerseits landschaftlich im ersten Morgenlicht wunderschön, ließ das Gelände für mich in großen Abschnitten aber nur gehen zu. Der Weg war sehr überwuchert, mit allen Arten von Gestein darunter, dass noch dazu von rutschigem Moos überwachsen war. Aber ich wusste, dass auch dieser Abschnitt vorübergehen wird und tat einfach was ich kann, um halbwegs effizient vorwärts zu kommen. Es ging nochmal über einen Kamm auf dessen anderer Seite ein sehr steiler und technischer downhill wartete. Da ich wieder mal zu faul war mir meine Schuhe ordentlich zu binden, war dies ein relativ schmerzhaftes herumgerutsche aber ich wollte einfach nicht zwischen zwei Checkpoints stehenbleiben. Ab dem nächsten CP sollte es für die verbleibenden 21 Kilometer meist der Küste entlang zurück nach Omis gehen. Ich nahm mir die Zeit um meine Schuhe zu binden, meine Lampe gegen Laufkappe und Sonnenbrille zu tauschen und mich auf die letzten drei Abschnitte zu begegen. Ich war definitiv bereit für ein finish und lief alle flachen Abschnitte und moderate Anstiege sowie die vereinzelten downhills so gut ich noch konnte. Ich wußte das Marko und weitere Verfolger wohl nicht weit entfernt waren. Würde ich jetzt zu gehen beginnen wäre es wohl nur ein Spiel weniger Minuten um überholt zu werden, dies wollte ich natürlich mit allem was ich hatte vermeiden! Doch mein Kampfgeist war nicht mehr all zu stark, ich befand mich ja auch noch nie in dieser Situation. Mir gelang es zumindest die durch Müdigkeit und des langen unterwegs sein, entstehenden negativen Gedanken auf die Seite zu schieben. Ein Zug von Psychoterror fuhr durch meinen Kopf doch ich sprang nicht auf! Ich konzentrierte mich rein auf all das, was noch perfekt funktionierte. Bis auf lädierte Zehen und einem interessanten Muskeltonus hatte ich eigentlich keine Probleme, mein Magen war perfekt, ich konnte noch immer Essen und Trinken, war klar im Kopf und befand mich in atemberaubender Landschaft am Ende eines anspruchsvollen Rennens mit einem Sieg vor Augen. Was konnte es also im Augenblick besseres geben?! Ich lief einfach so viele Abschnitte wie möglich, auch wenn mich die Mittagshitze und abschnittsweise lange monotone Anstiege immer wieder zum gehen zwangen. Ich lief drei Markierungen und ging die nächste, dann lief ich wieder und so weiter. Den Aufenthalt in den CPs versuchte ich natürlich auf ein Minimum zu reduzieren, Wasser, Cola, eine halbe Banane, Weißbrot und weg war ich. Hier will ich auch den Betreuern an den CPs besonderen Dank aussprechen, die mich allesamt motiviert haben und mir stets halfen nach dem CP den richtigen Weg zu finden. Der erste Blick auf Omis, von den Bergen aus, war eine große Erleichterung. Ich wusste, dass es jetzt nicht mehr weit ist. Natürlich kamen mir einige Abschnitte dazwischen noch endlos vor, aber das ist normal. Ich versuchte einfach das Spiel zusammenzuhalten und effizient Meter für Meter abzuarbeiten. Irgendwann ging es dann hinunter in die Stadt. Über steile Abschnitte, Stufen und an angeleinten Hunden vorbei, bis ich unten am Gehsteig bereits hinüber ins Ziel sah. Ich drehte mich nochmal um und lief mit einem unbeschreiblichen Gefühl in Richtung der Ziellinie an der ich schon von Renndirektor und Team erwartet wurde. Unbeschreiblich! Ich hätte mir nie gedacht jemals ein Rennen zu gewinnen. Das dies dann noch ein beinahe 100 Meilen Rennen war, machte mich sehr zufrieden! Weiters sehr zufrieden stellte mich das kühle Bier im Ziel und das Empfangen der weiteren Läufer die nicht lange auf sich warten ließen. Wer ein anspruchsvolles Trailrennen Ende Oktober sucht wird beim DUT auf vier verschiedenen Distanzen sicher fündig! Meine Schuhwahl viel auf den Hoka Challenger ATR III der einfach perfekt war und für alle Arten von Gelände für eine sehr gute Wahl ist. Wrightsocks haben perfekt funktioniert, ohne Sockenwechsel, keine Scheuerstellen oder Blasen. Auf Grund der langen Nacht war auch das Licht durch die Lupine Piko gold wert. Dynafit Hose + Shirt, kein Scheuern, gute Belüftung, schnell trocknend. Hammer Gels, Tailwind Drinkmix, Gummizeug, Oreos, Cola, Wasser,Weißbrot, Bananen, Orangen und zusätzlich Salztabletten. Nach dem meine Regeneration nach dem Großglockner Ultra-Trail sehr gut verlief, ich im Zuge des Pitz-Alpine Glacier Trail zum Trailrunning Symposium geladen war und somit schon vor Ort, entschied ich mich, mir das Pitztal genauer anzusehen und beim P85 an den Start zu gehen. Um 03:30 fiel gemeinsam mit der P100 Distanz bei klarer Nacht der Startschuss und somit der Sturm auf den Mittagskogel (3159m). Durch den starken Regen davor war der Untergrund stark aufgeweicht und das Blockgestein im oberen Teil mit Vorsicht zu genießen. Ich fühlte mich relativ leichtfüßig und konnte ohne zu viel Energie aufzuwenden einige Läufer hinter mir lassen. Im oberen Drittel kurz vor dem Ausstieg bevor es hinunter zur Gletscherquerung geht, befand ich mich in einer Gruppe von ca 4 Läufern hinter Flo Grasel, Gerald Fister und Martin Schedler. Der spätere Sieger des P85 André Purschke legte beim ersten downhill ein ordentliches Tempo an den Tag und ich beschloß mitzugehen solang es für mich Sinn machte. Den Gletscher erblickte ich zum ersten Mal im Morgengrauen, welch Anblick! Direkt am Rand des Gletschers wurden die Micro-Spikes über die Schuhe gezogen und schon ging es auf die ca 1km lange Querung die ohne Spikes (Pflichtmaterial) unmöglich gewesen wäre, da keine Schneeauflage vorhanden war und wir großteils auf Blankeis unterwegs waren. Die Spikes haben jedenfalls perfekt gehalten. Am Aufstieg zur Braunschweiger Hütte schloß ich zu Martin Schedler auf, der mir vom hohen Tempo der beiden führenden erzählt hat. Wir kamen beide zum Schluß das es noch ein langer Weg sei ins Ziel! Der lange downhill von der Braunschweiger Hütte zurück nach Mandarfen erforderte volle Konzentration und ließ mich die technische Schwierigkeit der Pitztal trails bereits erahnen. Nach dem man den Start/Ziel Ort Mandarfen während des Rennens 2 mal durchläuft gibt es die Möglichkeit Verpflegung zu hinterlegen, ebenso fanden meine Spikes ihren Weg ins Depot. Für mich ging es an zweiter Position in die Zweite Runde die uns hinauf zur Sunnaalm, dem Riffelsee und in weiterer Folge zum Taschachhaus führte. Auf sehr feinen Höhenwegen ging es gut laufend dahin, einige kleine Kletterpassagen und steile Anstiege rundeten den langen Weg zum Taschachhaus ab. Mittlerweile waren auch schon die anderen Distanzen auf der Strecke und der Start/Ziel Bereich den es ein weiteres Mal zu passieren galt, bei bestem Wetter schon gut gefüllt. Für mich ging es bei direkter Sonneneinstrahlung und dadurch sehr heißen Verhältnissen in die 3 Schleife hinauf zur Kaunergrathütte auf 2800m. Im hochalpinen Gelände ging es über einige Scharten und lange Blockfelder. Die Landschaft inklusive wunderschönen Bergseen wusste zu überzeugen, wenn auch alles in allem die Laufbarkeit des Geländes sehr gering war. Volle Konzentration und einfach ein Schritt nach dem anderen Richtung Tal! Am Talboden angekommen ging es für einige endlich mal laufbare Kilometer zur letzten Schleife über die Tiefentaler Alm. Der Gedanke, gute 15km am Talboden wieder hinein nach Mandarfen laufen zu dürfen, gefiel mir zu diesem Zeitpunkt gar nicht, aber nützt bekanntlich nichts wenn man ein Finish erreichen will. So ging es weiter einige hundert Höhenmeter hinauf durch den Wald über sehr wurzelige Wege zur Neuberg Alm und auf der Forststraße in vielen Serpentinen hinunter ins Tal. Ich wusste, dass ich an zweiter Stelle lag. Diese wollte ich nicht unbedingt verlieren also ließ ich es ordentlich laufen. Unten hat die Temperatur deutlich abgenommen, was mir sehr entgegen kam. Viele Läufer die sich noch am Weg zur Tiefentaler Alm befanden, kamen mir am Weg ins Ziel entgegen. Einige davon mit angezogenen Regenjacken, was darauf hindeutete, dass es Tal einwärts einen Wetterumschwung gab. Irgendwann erwischte mich dann auch der Regen, jetzt war das Ziel schon zu nahe um stehen zu bleiben. Die letzte Kurve, das Ziel in greifbarer Nähe! 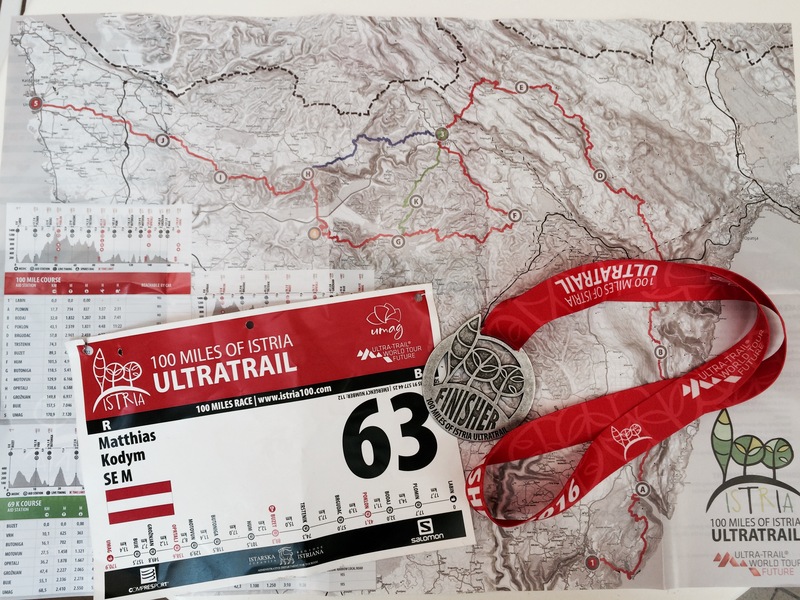 Nach 15h und 28 min mein zweites Ultra-Trail Finish innerhalb von 14 Tagen und das mit einem zweiten Platz overall. Freude war da. Danke Pitz-Alpine! Für den GGUT habe ich mich 5 Wochen vorbereitet, in dieser Zeit lief ich 500 Kilometer inkl. 4000-8000 Höhenmetern pro Woche. Meine längste Einheit während dieser Phase war 45km und 2600 Höhenmeter. Zur Abwechslung habe ich einige Rennrad Einheiten mit eingebunden, diese waren eher im regenerativen Bereich im Rahmen von 30-60 Kilometer pro Einheit. Ich wache auf und stelle fest, dass sich irgendwas im Rückenbereich seltsam anfühlt. Ein eingeklemmter Nerv? Genau was man braucht am Morgen eines Ultra-Trails! Ich schenke ihm nicht allzuviel Beachtung und versuche mit der Foamroll ein bisschen hineinzuarbeiten. Hilft nichts. Egal, spätestens einige Stunden im Rennen werde ich mich daran wohl nicht mehr erinnern können. Nach einem ausgiebigen Frühstück, begebe ich mich mit meinem Laufzeug zur Startnummernausgabe wo ich am Ausrüstungscheck 3 Stunden aushelfe und mich um diverse Anliegen der trailrunner kümmere. Spassfaktor war gegeben, im Zelt war es aber auch laut und heiß und somit war ich froh meine Schicht beenden zu können um etwas Ruhe zu finden und um mich auf meinen Vortrag + Aufbau von Beamer und Leinwand zu kümmern. Um 21:30 war alles unter Dach und Fach, somit ein letztes Mal ins Hotel, für das Rennen umziehen nochmal 15 min. abschalten und erneut zum Start/Ziel Gelände auf dem sich schon einige hundert Menschen eingefunden haben. Die Stimmung ist relativ ruhig, eine gewisse Anspannung liegt in der Luft, nur noch wenige Minuten bis zum Start..
Nachtstarts habe ich besonders gern, so kam mir auch die Startzeit des GGUT um 23:00 bei trockenen Verhältnissen entgegen. Wie in allen anderen Rennen auch, war der Start des Rennens relativ schnell, ich habe mich davon aber nicht beirren lassen und so zog das vordere Drittel des Feldes dahin. Auch am ersten uphill auf Asphalt wurde fleißig gelaufen. In der darauf folgenden singletrail Sektion reihte ich mich brav ein und folgte dem langen Zug aus Stirnlampen schweigend durch die Finsternis. Immer wieder traten Läufer aus der Reihe, da viele bereits jetzt realisierten das ihr Anfangstempo wohl zu hoch war. Am ersten CP in Ferleiten (km23) war ich jedenfalls froh das es nun mit den laufbaren, flacheren Abschnitten des GGUT erstmal vorbei war. Auf Position 20 verpflegte ich mich rasch und nahm den weiteren Weg durch das Käfertal in Richtung Alpenhauptkamm in Angriff. Der Wind frischte ordentlich auf und ich bereitete mich für den langen Aufstieg zur Pfandlscharte auf 2600 Meter vor. Essen, Trinken, ein bisschen Auflockern während dem Laufen und auf ging es der dunklen Wand entgegen. Das Schotterfeld hinunter machte richtig Spass, doch plötzlich erhellte sich der Himmel und unter einem gewaltigen Knaller schlug irgendwo hinter mir ein Blitz ein. Der Himmel öffnete seine Pforten noch weiter, ich nahm meine Beine in die Hand und zog während ich das Schotterfeld hinunterlaufe Jacke und Handschuhe an. Hardrock feeling garantiert! Am Lucknerhaus hielt ich kurz um meine Schuhe zu entleeren und mir die Jacke wieder auszuziehen. Hier schloss die führende Dame Juliette Blanchet auf, mit der ich mich auf den Weiterweg nach Kals gemacht habe. Kals liegt über der Hälfte der Strecke, hat die größte Verpflegungsstation und auch mein Dropbag wartete dort auf mich. Ebenso meine Schwester und viele Freunde des GGUT Teams. Ich fühlte mich noch immer sehr gut, aß einige Löffel Suppe, nahm meine zweite Ration Gummi/Ingwer-Bärchen aus dem Dropbag und begab mich wieder auf den Weg durch das Dorfertal und weiter über den Kalser Tauern zur Rudolfshüttte. Hier kam mir auch Flo Grasel entgegen und begleitete mich motivierender Weiße einige Meter, danke Flo! Flo hielt mich auch über den Rennverlauf am laufenden und zu meiner Freude war ich mittlerweile auf Platz 7. Nicht wirklich wichtig, da ich bisher mein eigenes Rennen lief und mich nicht so sehr um Stände gekümmert habe, doch so spät im Rennen mit noch einiger Kraft doch auch motivierend. Ich wusste auch das die Leute vor mir um einiges stärker sind und machte mich nicht wirklich daran aufzuholen sondern versuchte lediglich weiterhin meine pace zu laufen. Der Aufstieg zum Kalser Tauern ging relativ langsam aber stetig voran, oben angekommen lief ich die flachen Passagen und den downhill zur Rudolfshütte und somit dem vorletzten CP des GGUT. Auch dort erwartete mich schon freudig das GGUT Team inkl. meinem Vater. Ich checkte nochmal meine Vorräte, stockte um einige Hammer Gels auf und weiter ging es zum letzen Punkt auf 2600 Meter dem Kapruner Törl! Davor musste ich noch über einige sehr rutschige Blockfeld abschnitte, vorbei an vielen 50 Kilometer Läufern die auf der Strecke mit Start in Kals unterwegs waren. Der Anstieg aufs Kapruner Törl war zwar von meiner Wahrnehmung her relativ langsam, ich konnte jedoch ohne Pausen mich Meter um Meter weiter hinaufschieben. Das Panorama wirkte wie gemalt und ich erfreute mich immer wieder dem Anblick. Der Ausblick auf die Stauseen Moorboden vom Törl war einfach gewaltig, auch einige Glockner-Trail 50k Läufer waren fasziniert davon und gönnten sich eine Pause am höchsten Punkt ihrer Strecke. Sie feuerten mich an und ich stürzte mich über die Blockfelder hinunter ins Schneefeld das mich in weiterer Folge dem See entlang zum letzten CP Moserboden führte. Mittlerweile war es richtig heiß, ich hielt nur kurz im mir einige Stücke Wassermelone zu gönnen, füllte mein Wasser auf und auf ging es in die letzten 15 Kilometer vorwiegend bergab. Natürlich spürte ich meine Oberschenkel schon einigermaßen, ich konzentrierte mich allerdings mehr aufs Laufen und auf meine Schrittsetzung als auf Schmerzen und so konnte ich den manchmal endlos scheinenden downhill auch bewältigen. Einige Abschnitte vor allem die singletrails nah am Stausee erforderten nochmals vollste Konzentration da sie sich unmittelbar am Abgrund befinden. Auf den letzten sieben, flachen Kilometern nach Kaprun konzentrierte ich mich nur noch auf das Laufen im flachen, es galt jetzt unter keinen Umständen stehenzubleiben und in ein Gehtempo zu verfallen. Auf den letzten Metern schloss mein Teamkollege Volker Sauerzapf zu mir auf und wir teilten uns den siebten Rang in 17h 18min. Im Ziel erwartete man offensichtlich schon Juliette Blanchet was uns ebenfalls einen stimmungsvollen Empfang einbrachte. Es war einfach ein genialer Tag in den Bergen! Der GGUT war für mich ein voller Erfolg, die Strecke bietet alles was ein anspruchsvolles Trail-Rennen braucht, vom Hochgebirge mit Schneefeldern und Gletschern bis zu flowigen singletrails + sehr guter Atmosphäre. I ran 1200 kilometers and 50.000 vertical meters since January 25th in preparation for the race. My biggest week was 173 kilometers with 8200m vert. The second biggest was 155 kilometers with 7100m vert. My longest training run was 70 kilometers with 3000m vert. Most runs I did where in the 25k to 50k range. I never did specific speed work or intervalls. I did some body weight training and core exercises about three times a week. In the last 2 weeks leading up to the race I stopped drinking coffee or any other caffeinated drinks and cut down time on electronic devices such as smart phones and computers. I think getting away from distractions forced through computers and the internet helped a lot for a clear head on race day. I never thought further than to the next aid station for the whole race. Sometimes I had this thoughts when I am there like 40 kilometers further this and that might happen but I always could catch those thoughts and bring me back in the present moment, which was thinking just to the next cp. I believe that saved me a lot of energy. I had no mental downs throughout the entire race. I stayed positive and smiled or placed little jokes towards volunteers, runners and people along the way. I always got smiles back and that´s a huge part when it comes to staying positive for such a long race. After my DNF at 100 Miles of Istria 2015 I decided that I want to go back and give it another try this year. So there I was back in Umag after a solid 10 weeks of training (1200km/50.000vert) from the end of January on. This time I wanted to keep everything as simple as possible beforehand so I was happy that my parents joined me on the journey and delivered me right at the front entrance of the offical race hotel. The place held all amieties you can think of so I was not distracted by doing any chores other than making the way from my room to the restaurant and back. I took a short walk to the beach front in the evening, along the tennis courts, soccer fields and closed kiosks which are about to open when holliday season starts and when I am long gone. On race morning I met Florian, a fellow runner from Austria and first timer at the race at breakfast. We talked trail for a while and wondered how much food we should eat before. We came to the conclusion that we should not stop eating before we get tired enough for a litte pre-race nap and so we did. At noon my parents picked us up to drive us the three kilometers to town where the race bus leaves for our start destination Labin. So the race course goes from Labin back to Umag 173 Kilometers through the heart of the Istrian peninsula. At 04:00 pm the race starts. 250 anxious runners make their way through the old town of Labin and I bet I was not the only one surprised there because of the firmly new route through town. The pace was high and I felt like on a roller coaster up and down this very narrow channels in the middle of a herd of runners. I focused on the ground to not trip over staircases leading out of buildings. After that we followed single track down to the bay and a short stretch of asphalt along the harbour. It took a bit till I was settled and wondered why everybody is going so fast at the first 6km. From the first hill we could see the Ucka Mountains raising in the distance. The sea to the right, the mountains in the front I knew this is where I want to be. By arriving at the first check point I took time to cool down my legs and head a bit, refilled my bottles and grabbed half a banana. At this point I was probaply around 40th position. There where runners behind me who did not even stop at the first cp. Before cp2 30k in, the sun begann to set on the horizon, I was high on on a rocky plateau out of the forest. I caught up to many runners almost effortlessly. It was not dark yet but I decided to gear up with my headlamp so I dont have to stop for that later again in the dark. I love running at night. When it gets dark I feel like a hunter chasing down lights in the distance. When approaching other runners I always take time, I try to read there strides and see how the feel. By the time arriving the climb up Vojak the highest point of the race I felt really strong uphill so I caught about 20 runners up the steep trail. I knew I should not go to hard because it is still a long way to Umag but it felt really easy. The downhill to Poklon CP3 at 42k went smooth I ran it one time before and could remember a lot from last year even it was completely in the fog back than. Arriving at Poklon I began my aid station routine which goes like two cups of coke, half a banana, one salt pill and every now and then bread with nutella. While I ate volunteers refilled my bottles. The next section was mostly on hilly forest trails where I tried to recover a bit, so I ran, walked and ate. I felt like I am stronger in the technical sections, at least they where easier for me than the long forest roads. The last technical section down to Buzet went very well, I ran with an Italien runner, we chatted a bit and made our way to a hall in the town center together where the cp at 89k was. The atmosphere was good, I was not too tired, we high fived and after we got our dropbags handed everyone followed his own business. I had my peronin breakfast, a change of socks, shirt and headlamp, restocked on food and out I was again towards the next cp Hum. From Buzet on, most of the technical sections are over, the climbs still steep but short and all very runable terrain. I still felt good as day broke in, ran all flats parts and small uphills and downhills. My energy on the climbs was still good but I felt my legs a bit. My parents crewed me on the last 30 kilometers so I met them for the first time in Motovun which was great and gave my extra energy to see them there. My dad handed me the supplies I needed from my bag, mum took care of my bottles and we parted ways again. From now on I had coconut water at every cp I saw them which was super good as the day got hotter and hotter. The last cp at kilometer 157 Buje was insight, there I would see my parents for the last time till the finish in Umag. I was still in good spirtis, I felt the heat a bit but I was definitely ready for the last 13 kilometers to the finish. The last 10k felt the hardest I would say. It was super hot on those fields and the course zigzagged on never ending dirt roads. 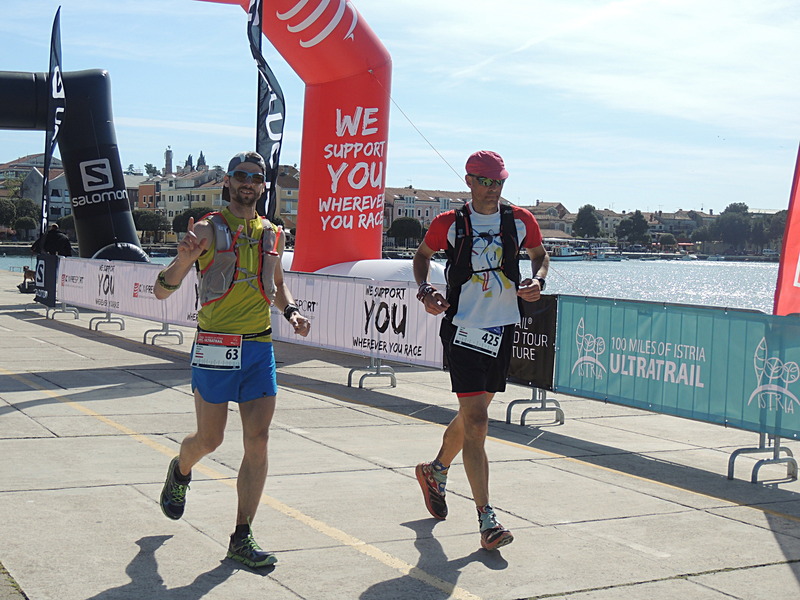 On the last 5 Kilometers two runners past me so I finished in Umag in 13th position overall. My main goal was to finish the course in under 24 hours so I was very happy with the outcome of my first 100 mile finish. My stomach worked solid the entire time, I mostly ate gels, bananas and some oranges. I used Tailwind (love it), water, coke(from km40) and coconut water for hydration. I had one portion of Peronin at halfway. I regularly took salt and bcaa caps during the race. I held my gear kit pretty basic, I loved the Hokas (Challenger ATR) on the rocky terrain and wore one pair the entire race. However as the distance and heat increased the toebox was a bit too narrow for my wide feet. So my toes where not happy during the end. I changed socks once. I used the Lupine Piko headlamp during the night and a lighter one from Petzl for the second half. 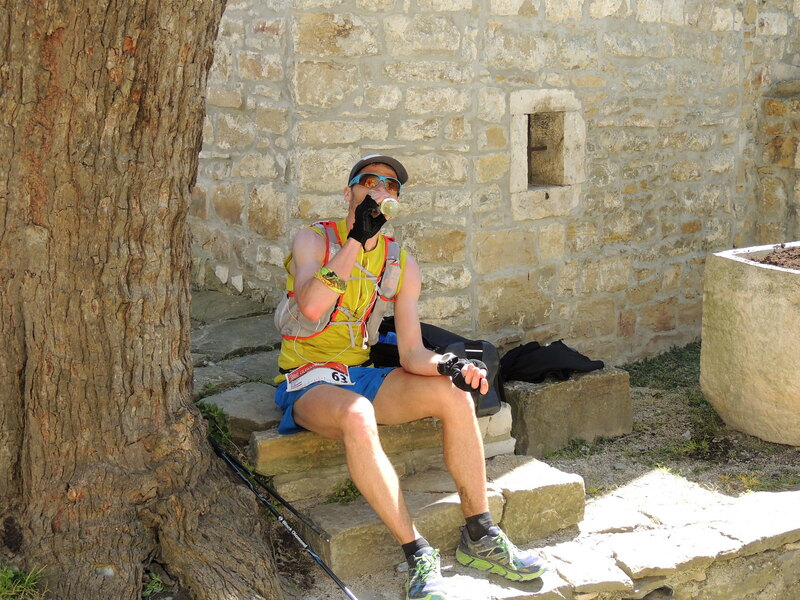 In 2013 I participated in the 100 km race from Buzet to Labin. When I first came across the 100 mile runners which where on the same course than us, I said to myself „never will I attampt an 100 miler on that course“. However I signed up for the original 100 miles of Istria in Autumn 2014. Training and preparation really went well, I was able to do some ski-mountaineering and because of a really dry February and March there was some decent mountain running possible. I never got so many kilometers and vertical meters so early in the season. Well I never decided to do a 100 mile race before. So a few days before race day, Anders, Mike (did the 65k) and I where going down to Umag, Croatia. Apartment check in, Bib number collection and grocery shopping. A short run in the afternoon as a kind of heat attaptation. Unfortunately the weather for race weekend was looking more like rain than sun. After stepping out of the Bus in Labin (where the race started) I noticed a light drizzle and wind which felt cold. Instead of waiting outside for 45 minutes till the race starts I went straight to the restaurant across the square for a cup of tea. Other runners allready in, eating, preparing, checking headlamps and the race course. It was warm inside and the tea tasted really good. I felt calm. Just minutes before the gun went off I sneaked trough the field to get a little closer to the starting line. And off we where. I could not believe how fast others went out at the very beginning of a race that long. I was not too impressed, found a comfortable rhythm and cruised down the first downhill to Rabac. I noticed that it became really warm further down, runners in front stopped and removed their jackets. I jogged along the seafront in Rabac, out of the town and followed the marked course on dirtroads up to the mountains toward the first refreshment station at km17. It got dark, but still enough light to save batteries on the headlamp. I closed the gap between some runners in front by mostly walking uphill. As it got completely dark, the fog came in. Really thick fog, making a visibility of maybe 1 meter. Headlamp strong, blinded. Headlamp dim, tired eyes. I played around between those two for most of the time, remembering how technical this terrain actually was. My hopes that the fog is just along the coast where high. I closed up to more runners on the downhill into the first aid station. The fog cleared below a certain elevation. I just filled my bottles and off I was again, climbing up a dirt road for the next section of single trail. The further up I climbed the more fog appeared again. I caught up to more runners, and after about 25km in, I was right behind Nerea Martinez. I started questioning myself:“Am I too fast“? No matter what, I felt really great and could go a decent pace without putting too much effort in. The terrain certainly got more technical, sharp rocks in all sizes and heights all over the place, slippery from the dew, hard to see because of the fog. It did not take long till I hit my toes in full motion. From the sharpness of the pain I knew that the rock was hitting the nail hard, I had this before. Refreshment station II came in sight. Not really actually, I just noticed a bunch of headlamps gathered around a few other people. The volunteers wrote my bib number down and offered me refreshments, I filled my bottles again and continued further on the trail towards Poklon. I remembered a really technical stretch in that section from 2013 through the beech forest. Fog, night, slippery terrain and mud did not make it easier this year. My headlamp started blinking as indication I have to change batteries, which I did not immediately of course. I calculated..still more than 6 hours darkness, the first battery did after 4..what should I do If I run out of batteries before daylight? Wait somewhere till darkness disappears? What If it shuts down right now? Will I be able to change the batteries in complete dark? Will I loose orientation and wander around like in a dark room? Of course nothing of my mind made scenarios happend, at the next checkpoint there was enough light to change the battery pack without to hassle. Rolling down the trail into Poklon was cool, I could see the yellow streetlights around the aid station through the trees and people chatting and cheering. I knew I had some pretty though terrain behind me and also the first 42km under the belt. Still in a good mood without beeing too tired. I had some segments of an orange, filled my bottles with tailwind and water and left after drinking some coke for the first time during this race. I was happy to be on easy rolling forest track where running was possible. The hours went by pretty fast, sections of technical terrain followed by more runable and forest track. Up a mountain and down and up again. At around 06:00 am I arrived in Trstenik (km 73). I remembered the place from 2013, It is a really small place but very cool place with houses built of stones and the refreshment point in a really nice driveway of one of them. I felt a bit tired from the last downhill where I noticed also the burn from a couple of blisters on my toes. I got water, more coke and left towards Buzet (halfway) after chatting with the volunteers for a while. One told my that there where only about 10 100 milers through at this point which was cool and gave me some sort of boost. Daylight broke trough the clouds, I could hear the birds singing from the trees and all in all I felt really good getting new spirits into my head. I stowed the headlamp into my pack and started marching uphill. After a while I saw somebody in front of me, from the dirt on his calfs and moving from left to right I could swear it is a 100 mile runner. Indeed it was Adam Hewey. Again I started asking myself. Am I too fast? But still I felt good without giving all my efforts on the uphill. The downhill into Buzet, which is one of the longest on the course was hard tough. About 1000 meters descent and again very technical trails. Down there my toes hurt from kicking rocks all night long. Not even really in the refreshment station I got allready my dropbag offered from on of the very attentive volounteers. Thanks! I really took my time here, thoughts from quitting came into my mind. Do I really want to go for another 85km? What If my toes are getting worse? Why am I doing this? I took of my shoes just sat there for minutes. Runners came in, runners went out. Some looked fresh, some looked tired. My mind said, continue! So I changed socks, got my sore toe taped, put on my trusted Cascadias and out of Buzet I was. After taking a break for about 40 minutes. I knew that the second half was not so technical anymore, also I had just 2000 meters of climbing left at this point. 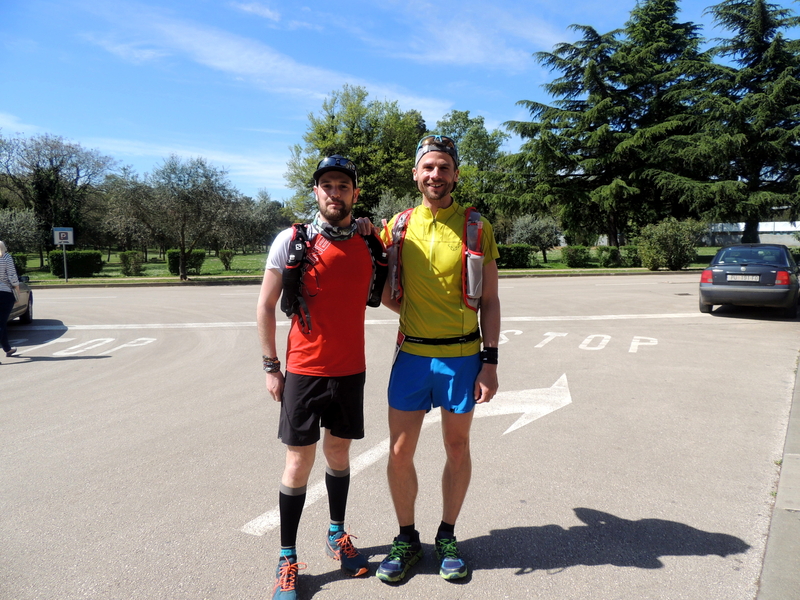 While pausing in Buzet, both Nerea Martinez and Adam Hewey caught up and left the aid station before me. I caught up to Nerea just a couple of kilometers later, Adam nowhere to be seen. The terrain really felt easy after the hard first half. Even with not the freshest legs I was able to run good chunks. Instead of rocks there was mud now, a lot of mud, making shoes really heavy and sticky to the ground. Rivercrossings, a pool of mud, relentless uphills through sections without trail and so on. I arrived in Hum having done roughly 100km now. The rain that started earlier got heavier now. I decided to put on my jacket, which was not the most waterproof of all. Leaving Hum I felt really cold allready, but with less than 10k to the next checkpoint I was in good spirits. Heavy winds and more cold rain, I doubted I could last long out here with no change of clothes and weather that does not look like it is improving soon. I said to myself if it is not getting better in Draguc I have to bail out. I was just shaking all over not beeing able to open my bottles or any wrappers from my supplies anymore. Luckily my brother-in-law and my sister where waiting there, which I did not know before. I got into the car and my race was over. Another time maybe. Things learned: Adding weight in form of a proper jacket and a change of clothes will pay off in the end! Thanks to Alen and his crew for setting up 100 miles of Istria! Earlier in the year Anders and I where writing back and forth looking for the right trailrace to participate in together. He came up with 100 Miles of Istria which was held for the first time this year. Since I knew Istria only from going on vacation with my parents as a child, it sounded really appealing to get to know the mountain areas spreading through the country. So I picked up Anders and Gerald who signed up for the 100 miles distance and off we went. 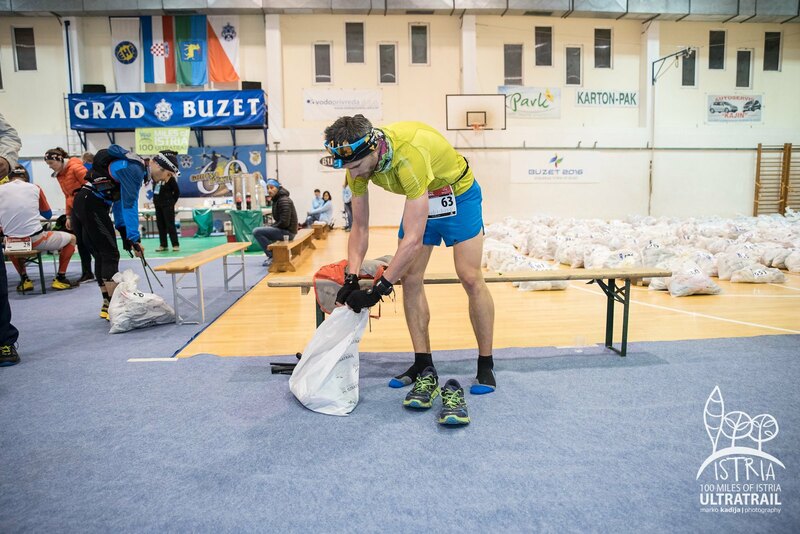 After spending a day at our apartment we drove down to Koromacno to pick up the bib numbers. 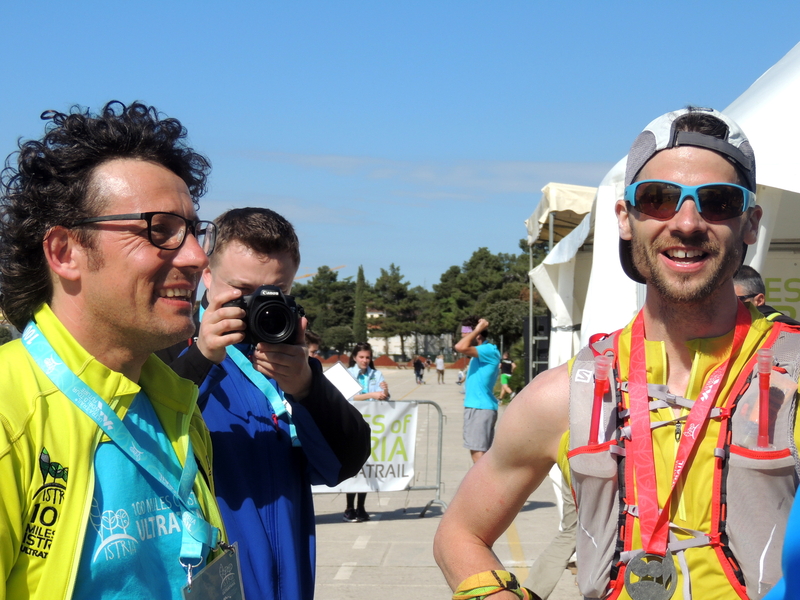 Gerald was starting the 100 miles at 9 p.m. that day so he stayed at the finish area to catch the transfer bus to the start in Umag later. We enjoyed the nice warm weather down at the sea and later we looked for the trail which runs down from the mountains close to the finish. Later, Anders and I where driving back to the apartment, preparing for the race the next morning by looking at maps and profiles. As always the night before the race felt like catching no sleep at all. My alarm clock woke us up at 3:20 a.m. since we had to catch the transfer bus leaving close to 5. Bus ride was kind of horrible with lots of construction work on the way to Buzet. I felt tired and somehow not too excited. We met Gerald who decided to quit here after 60km. In Buzet around 120 runners gathered at the starting line. At 7 the race was on. Anders and I worked together from the first minute and found our pace really quick. Walking uphill, covering ground on the flats and descends. We reminded each other on not going too fast in the beginning because it is going to be a long day anyway. The terrain in the first half was already technical but ok to run in most parts. We got wonderful views along the way and where really excited to run together. Since Anders and I have not met since the end of the PCT two years ago, we had enough to talk so the time went by fast. After 10 hours I was still wondering why there has not been a low point yet. Later in, we where thinking about a 16 hour finish time, since most of the long climbs are behind. Before we descended down to the Checkpoint at km 68, a runner from Slovenia told us we are around 10th position. This was very motivating because I had no idea where in the field we are. What we did not expect was, that the terrain closer to the coast was getting much worse than in the beginning. Very hard to run on, especially with tired legs. A fall here would mean a serious injury. I crashed my toe into a rock once which felt like I twisted the nail of the toe. But I did not stop to look for it. Between Rabac and Labin the trail got very steep, they installed cables to make the way down possible. We had to climb over a waterfall to reach a checkpoint. A beautiful place but at this stage I was too tired to get out the camera for pictures. I really had to focus on every step I took. At the climb to Labin I felt really really tired. I knew that this point will come and I knew also how to go through and feel better again. 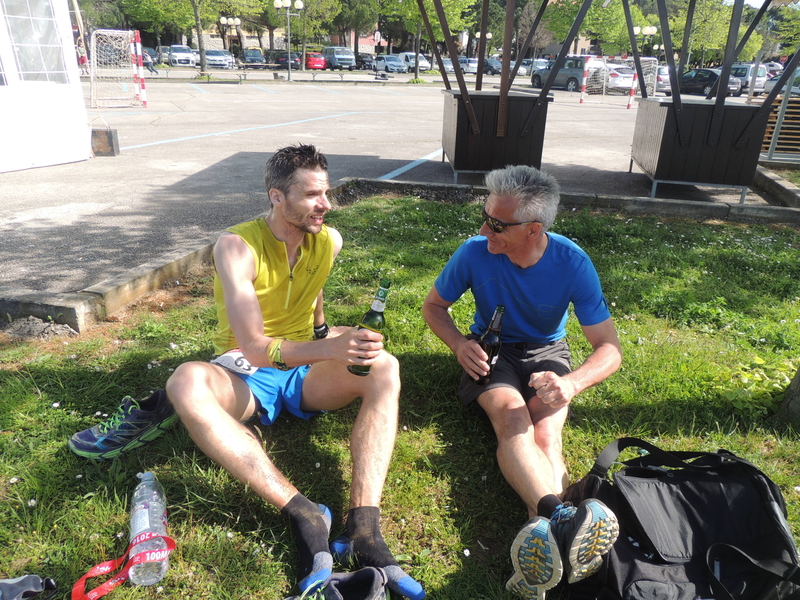 At the checkpoint in Labin I changed my socks again and fueled up for the last 20 km. We turned on our headlamps and off we where into the night. Twice we had to retrace our steps because we could not find the waymarkers anymore. We where ready to finish and kept pushing downhill, wondering when we will get to the dirt road which we knew from inspecting the trail the day before. After that dirtroad, we came down to the paved road, which lead us the last km into the finish in Koromacno. After close to 18 hours on our feet we where more than happy to be done and finishing 10th place overall. All in all, it was a great day and I am really happy about staying save and healthy along the way without having too many problems with fatigue or lack of motivation. 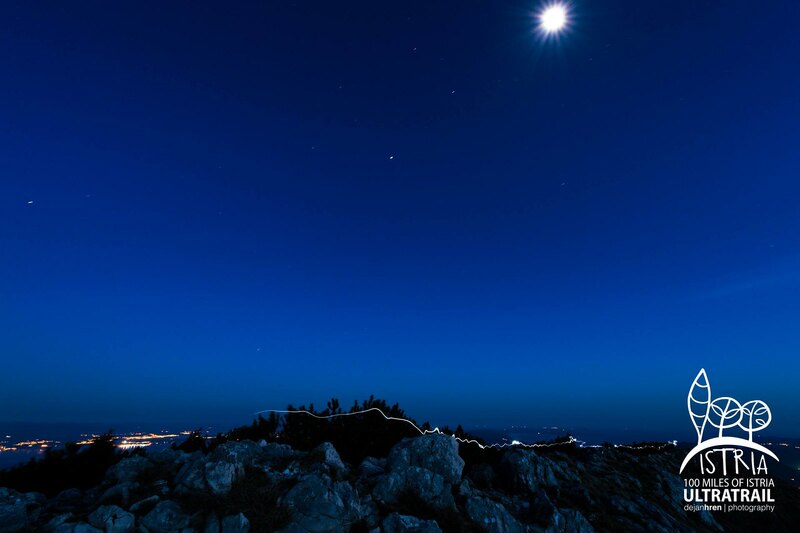 The experience running through the mountains of Istria is something I dont want to miss. We endured. Great organization and enthusiastic volunteers too! I knew It is going to be hard.I knew the fact that I can handle the cold much better than the heat. So here I was in a pack of 120 other runners at this small village Veitsch. I made two mistakes in the first half of the race, I started way too far in front and the second was I did ran the first 18km also on the uphill. After 21km the trail started to climb the steepest 600m of the whole course to the top of hohe Veitsch. I was really tired on the climb and felt that my right calf is going to cramp at any second. At this time I could not wear my running shirt anymore because I felt like it is keeping the heat to much at my body. My head was aching so I made my own ac wrapping the shirt around my head and soak it in water at every possibility. Worked great for my head but not for my back as the sunscreen was washed away from sweat and water long ago. At one of the checkpoints they had magnesium tablets which helped against my cramping leg. After 30km I was close to quit the race. I just was not there. My body felt not too bad but my head was saying no. I met my parents at this aid station, I sat down and spoke to them. Everybody around me suffered. Even the people who where not running. 24km left. I took my fresh filled bottle and made my way downhill knowing the hardest part is behind. The heat of midday was unbearable. I literally just moved one leg in front of the other thinking about the next step following the trail over hilly terrain. The last 5km where all downhill through a forest with the last kilometer into the village and the finish line on paved road. I was never so tired my entire life but still happy about the finish. I started running in February 2010 and never run a typical marathon distance except a half marathon (21km) after 2 months of training. Then I found out, that running in the woods and mountains is so much more enjoyable and fun than on paved roads. In 2010 I hiked 8 days from Port d´Andratx to Pollenca. On April 28th 2012 I ran the distance of 107km with a positive 4500m gain in elevation in 18h:46min. Both where great but different experiences. It is 23:58. I am one out of 500 runners who are waiting lined up at the start area for the clock to jump on 00:00. They start to play „Carmina Burana“. I know something great is going to happen. I focus on my breath, click on my headlamp, the two minutes are over and the field rolls out of the village of Port d´Andratx. I try to make my strides as small and low as possible, to keep the impact on my body low. The paved road comes to an end, I follow the pack into a small dirt road. The lights around me are so bright that I switch mine completely off. I found a group of 3 who are about my pace. I know that I should not get out of breath in the first hours during the race. The road is going steeper and steeper. One of the group is slowing down. I dont understand what he was saying because it was spanish but I think he told his friends to slow down aswell because this is going to be a long race. So did I. We started to climb while turning into walking. I notice hundrets of lights around me, red blinking back lights and the beams of strong white headlamps winding up the mountain. A strong feeling surroundet me, I knew it was right to face this challange. I arrived at the top of the hill, eager to make some good effort on the downhill. The first two hours went by and I was not far away from the first aid station. There was some paved road into the village of Estellences. The guys at the checkpoint wrote down our bib numbers and showed the way into the garage which was the aid station. It was hot and humid in there. I took of my pack, refilled my bladder, had two cups of coke, half an orange and took a banana out for the upcomming section. Other runners where sitting around and taping their feet or stretching out. I was just feeling to continue as fast as possible. The field stretched out more and more and there was no one around anymore. The trail climbed and went down again, with flat stretches inbetween. The hours went by I was very confident with running through the dark from one checkpoint to the other. It was allready more than 5 hours in when I reached the town of Valdemossa. The day began to brake in, this was the first time I could recognize the scenery I allready hiked through a few years ago. I knew, up the next mountain there will be a beautiful ridge waiting and I will arrive on top just right at sunrise. I talked to some french runners on the uphill. The only people I talked to during the race. They where joking around and saying something like „this race starts at Kilometer 70“ which I believed in but I did not care because all I wanted is to cross that finish line. So I arrived at that ridge hiking fast the switchbacks up before. I spoted the long shadows of other runners stretching over the pale gray bolder fields above tree level. To the left there was just the see below a 300 meter vertical cliff drop. I knew I am not far away from the 55k mark and the halfwaypoint of the trail. There was a big downhill waiting into the village of Deja. The trail got really steep and technical winding down the mountain into beautiful olive groves and through overgrown areas covered with long blades of grass. At the checkpoint in Deja I sat down for the first time. I brought some spare socks and now over halfway the time has come to change them. The once I whore where completely soaked. I refueled by eating some big blocks of cheese and white bread. Took some oranges and bananas and off I went again. The heat of the day arrived, I was happy about some cooling winds on the exposed areas. On the way to Soller a really fast runner overtook me at the downhill. I thought going downhill at these speeds after 60km requires some serious skills. Later I found out that it was the leader of the shorter competition which started at 8am in Valdemossa.He has serious skills. I arrived in Soller during midday. It was really hot. At the aid station I just took some fruits and refilled my bladder. I could not eat the meals the had there because my appetite for cooked food was just not there. There was this big climb waiting up the canyon towards Cuber Basin. I went really slow but steady up the trail which was combinded with large stairs. More runners from the shorter distance overtook me. I ate the food I carried from the beginning on my way up. Such as Energygels, Bars and PB ride shots. I brought way too much food but I did not want to leave it behind. Up the canyon my feet where really heavy. I had to force myself into running again. Mentally I felt still very good. I knew I could do it. I was just tired and slightly dizzy from the heat. At the last Aid station in Lluc I opened that Gatorade Strip I brought last year from the States. Mixed it with cold wather and enjoyed the taste. From Lluc there where just 17km left to the finish. I knew I could do those in about 2 hours reaching the finish under my personal goal of 20 hours. The last downhill really took forever. My legs where tired and I had to be really focused not to stumble over these rocks and roots. The last 7km where flat paved road combined with some trail just a little below the road. Cars where blowing their horns from time to time cheering us. High fives where given from other runners. I just wanted to get it done. My legs felt good on the easy trail and I just ran as fast as I could these last kilometers and across that finish line. After 18h:46min I finished in 119th position out of about 300 finishers. On the next day my legs felt good and I could not wait to enter the breakfast buffet at the hotel. -Something I learned from long distance hiking. Split the course into small chunks. In that case running from one aid station to the other. Since September 2011 I never run further than 25km. I was never going further than 80km a week. More like 40-60km. On all my trainig runns I gained 600 or more meters of elevation up and downhill.